The term “sprezzatura” may not be familiar to everyone. 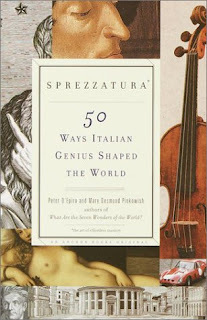 The book Sprezzatura* – 50 Ways Italian Genius Shaped the Word even footnotes the definition on the front cover: * “the art of effortless mastery”. Of course our faithful 6 Travelmarx readers may recall that we have already mentioned this in previous posts Baby You’ve Got Some Sprezzatura and Child Sprezzatura. In those posts we defined it as a certain nonchalance that makes what one does seem uncontrived and effortless. The book reminds me a lot of the series Connections, because each chapter is like the start of a detective story. There are enough names and dates dropped in any given chapter to keep you researching for days. One detective story stood out for me is Chapter #31 Catherine de’ Medici: Godmother of French cuisine where we start with Catherine de’ Medici (1519 – 1589), talk about Platina’s Book – an Italian cookbook from 1474, the Sicilian Francesco Procopio and what he was doing in Paris, Café Procope, Maria de’ Medici (1575 – 1642) – another Medici French queen, and finally La Varenne (1618 – 1678) who worked in Maria’s kitchen.